Please someone, tell me that it’s ok to slow down…. This may have been the stupidest thing I’ve ever done. And I’ve done a lot of stupid. 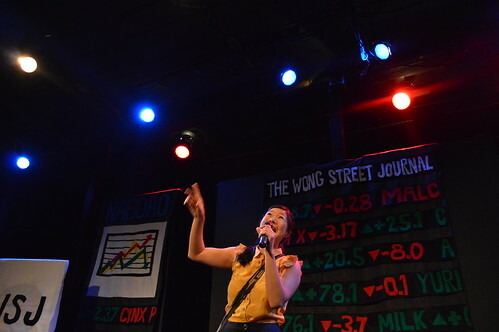 I scheduled a vacation BEFORE my World Premiere of the Wong Street Journal, rather than after. A world premiere is a lot of work and while I haven’t had a real vacation in a couple of years, I am hoping I am not pacing around the beach trying to find wifi to promote my show. At the time when I spotted the $400 RT tix to Manila (except it flies from NYC, adding more $$ to the trip), it seemed like a good idea. But now I’m like running and running and running out the door to get everything done. THE GUILT IS KILLING ME!! I CAN’T STOP WORKING!!!! Ever since my infamous blog post for xoJane about white dudes with Asian fetishes I’ve pretty much been running around non-stop. Even in Gulu, Uganda, the locals remarked how I never slowed down. I actually hate slowing down. I kind of love the adrenaline. So I’m not sure how well I’ll do in a situation where my job is to RELAX. I’m typing fast that’s how unable to slow down I’ve been. I squeezed this TV appearance last week in with Florence Henderson on the Huffington Post Show last week! She talked about how she got crabs from the ex-mayor of NYC. Childhood dreams come true! I can’t stop running around. I’ve joked with my travel partners that I will be so bored on the Island of Palawan that I’ll likely build a school with my bare hands or something. Anyway, enjoy the trailer of my show below and tell everyone in San Francisco to buy tickets! 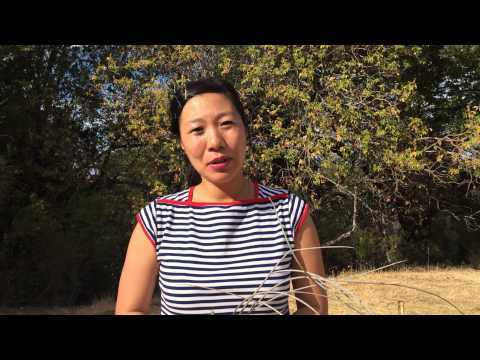 THE WONG IN REVIEW FOR 2014…. It’s been a tumultuous year in the world. On the bright side, my mother has stopped nagging me that I need to be “more like Bill Cosby”. 1. Got to live out my secret dream of being a reality tv star! I didn’t flip any tables. But I turned some tables on yellow fever dudes with HILARIOUS RESULTS. This episode is the most watched on MyxTV! And yes, you can only watch it from a desktop or laptop. So much of the last two years have had me re-evaluating my work and relationships with the Black community (both in America and Uganda), considering what privilege I have even as someone who is of a marginalized identity here, and what privilege I can cede to recenter the most silenced of voices within the Black community. I’ve been thinking how my own work and humor (which is drawn so much out of my own life and politics) contributes (or hinders) the liberation and re-centering of black lives consistently left behind by the progress of social justice movements. 3. 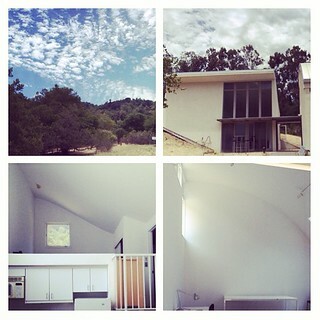 Got a lot of writing done at Montalvo Arts Center! I spent most of this summer in the middle of the woods (in Silicon Valley) in a gorgeous studio, writing down everything I remembered from my trip to Uganda and creating the spine for my new solo show. I ended up with 250 pages that looked like one hell of a memoir. From those pages, I pulled the best stuff to turn into this play I’m making now… The Wong Street Journal. 4. Made a second reality tv show that’s ACTUALLY family friendly. Check out this really ridiculous episode of MYX TV’s Eat Your Words where I make sushi with character actor Rodney Kageyama. 5. 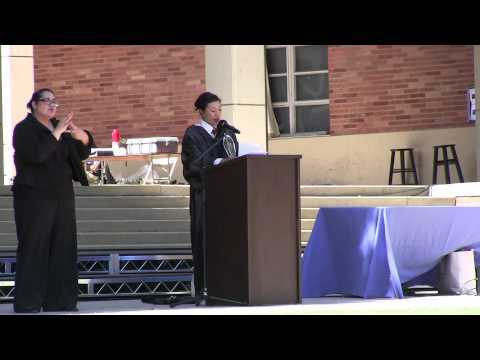 Gave the Commencement Speech at UCLA (again!). 6. Wrote some real badass essays. Some of which my academic friends say they’ll teach in their classes! 7. 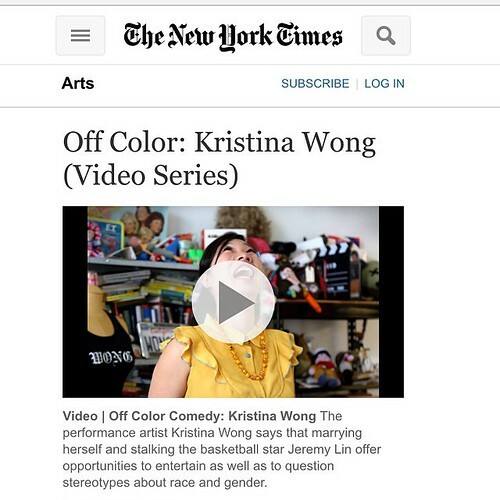 Got profiled by the NY Times! 8. Got profiled by the LA Times! 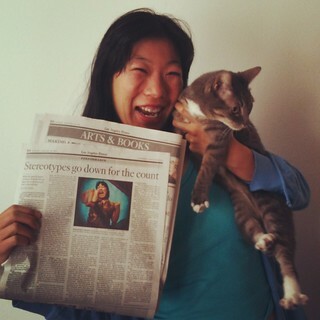 My cat Octavia is the second cat I’ve had to get a mention in the LA Times! 9. Gave a lot of Keynote speeches. 10. I might be the only comedian to ever have sewn the New York Stock Exchange out of felt and then performed with said set at the Comedy Central Stage. Post conflict Uganda? 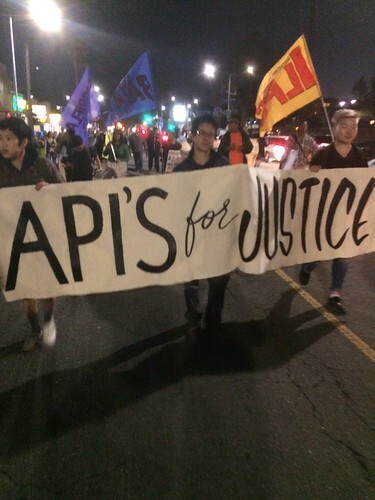 Microloans? Rap? An end to poverty? Chinese people who turn white once in Africa? This new show is the most complicated thing I’ve undertaken since that funny show I made about depression. 11. Continued to build partnerships with my friends in Uganda. Raised over $500 from friends so that my friends at VAC-NET could put on their annual Drama and Dance Festival. 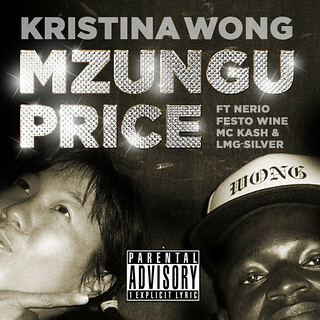 Also, sales from my RAP ALBUM helped pay for the initial costs of Nerio’s Studio in Uganda! 12. Booked a part on General Hospital! I even wrote about the greatest four lines in the history of soap operas for xoJane! 13. Didn’t marry Jeremy Lin, but came $303 short. Some people called it “the creepiest Kickstarter ever.” I called it the truest manifestation of love. When I heard Jeremy Lin would be moving to LA to play for the Lakers, I immediately registered our wedding on The Knot and I tried to raise $5400 to buy two courtside tickets to woo his love. After a hellish 30 days of insufferable cyber-begging, I fell just $304 short of my goal. Sure I was devastated, but that did not stop me from raising our children…. 14. A lot of Comedy Honors….. This short that I made with Tani Ikeda made the Honor Roll of Comedy-- Salon’s “10 of the Best Moments in Political Comedy This Year”! I also was at SXSW this year with xoJane’s “Fearlessly Funny: The Women Changing Digital Humor”. AND JUST SO YOU KNOW… Internet lists are LEGIT SOURCES OF NON-SUBJECTIVE NEWS. 15. 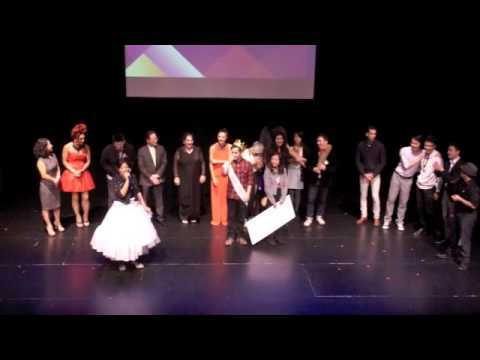 I hosted Mr. Hyphen 2014!!! 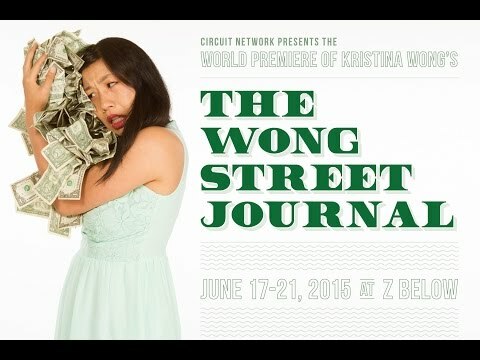 2015 will have a lot of good stuff to look forward to… The Wong Street Journal is previewing all over the country and has its WORLD PREMIERE in June! I just booked a ticket to the Philippines in May (found a RT ticket for under $400!). I ‘m really really close to some super big things that I will announce soon! This is where my life was always supposed to be. I just had to kill the critics in my head. Happy New Year! I had a (hilarious) nervous breakdown on Reality TV trying to prove to Sensei Yuji Matsumoto of Kabuki Restaurants that I could make sushi better than them. Me and 657 year-old character actor Rodney Kageyama were challenged to make sushi on MyxTV’s “Eat Your Words.” We are judged by Master Sommelier of Kabuki Restaurants, Sensei Yuji Matsumoto. Did my one day sushi making class at Santa Monica Community College put me on par with master sushi chefs? Find out in the Episode BELOW! Please tweet me @mskristinawong and #eatyourwords so I know you are watching! I originally started as a judge on the show but because I was so harsh, Eat Your Words told me I had to really prove myself as a cook. Here I am on Episode 3 as a Judge… If you ever wanted to see food described like bowel movements, this is the episode to watch!! And here I am getting reparations for Yellow Fever on Myx! Check out my Cavities in the NEW YORK TIMES! I’m finally in that part of the story where the Hero moves out of the crisis and towards the rising action. I’m going to climax soon my friends. And I’m going to enjoy it for as long as possible because I’ve been working way too hard just to get the foreplay part going to let it spark for just a second. Procrastination combined with romantic obsession is a great combination that’s not helping my play get written any faster. But love calls. When I found out last week that Jeremy Lin was moving to Los Angeles to be closer to me, I knew it was a sign to abandon everything and start planning the wedding. 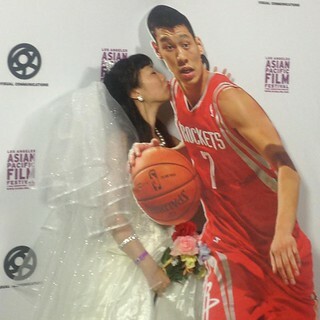 Here is my Kickstarter campaign “I WILL MARRY JEREMY LIN”. I’m raising $5400 to buy two courtside tix (yes, that’s the price of tickets for one game) so I can better woo my man this season. A contribution of $1 gets you an invite to the wedding! Here is the wedding page I have set up on THE KNOT. Sign the guestbook! 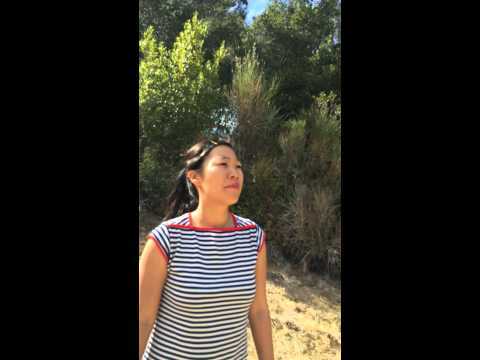 Here is an improvised poem for Jeremy that I recorded here at Montalvo. Here I am rehearsing my wedding vows.